The start of the fall semester is one of my favorite times of the year because it brings new faces, energy and a lot of excitement. This fall, we’re celebrating the 50th anniversary of UCF’s first classes. Our university has come a long way on the national stage in a short time. We are staying true to our long-held values of access, excellence, diversity and belief in the power of partnerships. Those values have helped us prove that bigger is better when it comes to how we serve a large, diverse student population, maintain high standards and keep tuition affordable. Our approach is working, as our incoming freshman class is setting records for grade point average and test scores! I said in my first week as president that inclusion and diversity have never been more important to UCF. Soon, more than half of our students will come from backgrounds that have historically been underrepresented in higher ed. Later this fall, we’ll celebrate our new status as a Hispanic-serving institution. Today, I’m excited to announce the search for a new Vice President for Diversity and Inclusion who will power change across UCF. Join me for a campus forum to discuss inclusion and equity on Aug. 30 at 10 a.m. in the Key West Ballroom in the Student Union, where we’ll talk about how this new position can have the greatest impact. My immediate vision as president is for UCF to be recognized for its excellence. 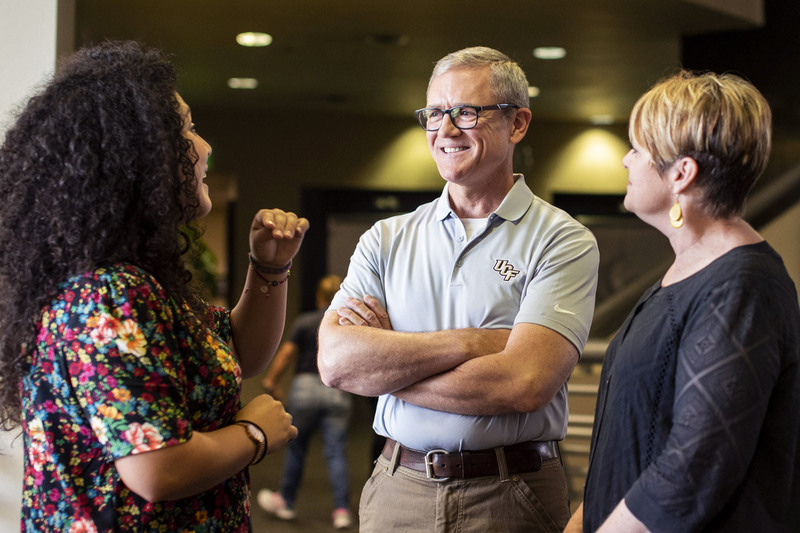 My long-term vision is for UCF to own the 21st century as an institution that lifts lives and livelihoods, identifies talent across all of society and fuels economic growth that creates broad-based prosperity. These conversations, and others throughout the fall, will help me develop our collective vision for UCF, one I will share at my inauguration during Homecoming Week. With former and current Knights on campus and UCF hosting Navy on Veterans Day weekend, I can’t think of a better time for us to celebrate UCF’s future. Best wishes for the fall … and Charge On!